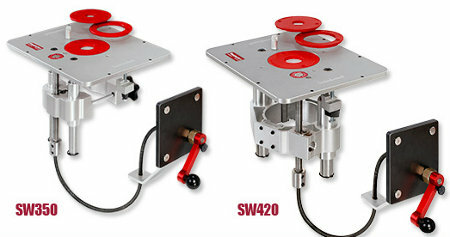 The whole point of a router lift is to make it easy to quickly and accurately adjust the height of a router. Most router lifts are pretty accurate, but sometimes adjusting them isn’t a quick as it could be. Generally you have to use a special tool for the top of the table to adjust the height. Woodpeckers’ new Side Winder Router Lift uses a flexible cable and crank that can be mounted within easy reach to quickly raise or lower the router. The lift fits a standard 9-1/4″ by 11-3/4″ by 3/8″ deep router plate cutout. You clamp the lift from the bottom and can mount the crank on the side of the table. The lift allows you roughly position the router with a 1/4″ turn of the lift wrench. Then you can position the bit with the crank, which raises or lowers the router 1/32″ per rotation. Conveniently, the lift has enough travel so you can raise the router above the table to change bits. Woodpeckers sells two different lift models — one for 3-1/2″ diameter routers like the Porter-Cable 690 series, and one that can be adjusted though the use of motor pads to fit a variety of different-sized routers. The fixed sized lift will cost you $260 and the adjustable size lift will set you back $360. This looks cool, but I would be a little leery of buying it. We have a couple lifts on routers at our shop. With the lifting screw offcenter like that, it puts the mechanism in a bit of a bind. When it is brand new and well lubed it works like a charm. Later on you have to lube it every time you adjust, and still use quite a bit of force on the spinner handle. I don’t see how this one would allow you to apply much force to the mechanism if it gets sticky. I would think that the cable would just start to twist up. I have never understood why tool manufacturers aren’t offering complete, stand alone, fully powered, etc router tables (what I have dubbed “table routers”) right along side their table saw line ups. This router table accessory alone costs more than an entry level table saw and miter saw. I mean if you were to compare the functionality and price of a table saw like the Bosch 4000 (around $600) with the price it would run to assemble a router table with the same functionality you’d be paying about $900 and that price wouldn’t even include a single router bit. As I have had this gripe for a long time I may as well answer some reoccurring retorts. Yes, I realize that there have been a few table routers offered in the past by tool manufacturers but let’s be honest those were some rather pathetic devices by comparison. And yes, I also realize how easy it can be to make a functional DIY router table (which still cost you at minimum the price of a router). But let’s face it, making a functional DIY table saw wouldn’t take much either yet we don’t see many of those in woodshops these days. And finally, no I don’t just want a shaper the blades are too expensive, too limited in profile, not nearly as available to purchase, and a pain to keep sharp. Router bits are the way to go in the modern woodshop. They do. It’s called a Shaper. I would like to see a fully electronic router table with graduated adjustments. Kinda like a CNC mill. You could zero out the table, then dial in your desired depth, and pow! You’re set. If you graduate it down to 1/128th or so, fine adjustments should not be a problem. How hard would this be. I know over at cnczone.com, they are always modifying cheap mills to CNC. For the $360 smackers you put into this, you could probably develop your own CNC option out of some harvested lead screws. It seems that shop technology is 15 years behind where it should be. A typical response but apparently you didn’t get my point. At least David has the right idea.